Do you want know what power supply you have in your PC? If your answer is yes, then keep reading as here I am going to tell you about how you can find out the details about your PSU, which is currently installed in your computer. 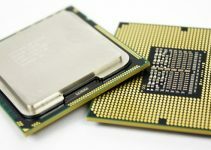 It is always good to know about your computer components, particularly PSU, because it is one of the most important computer components, but its importance is often ignored by most of the users. 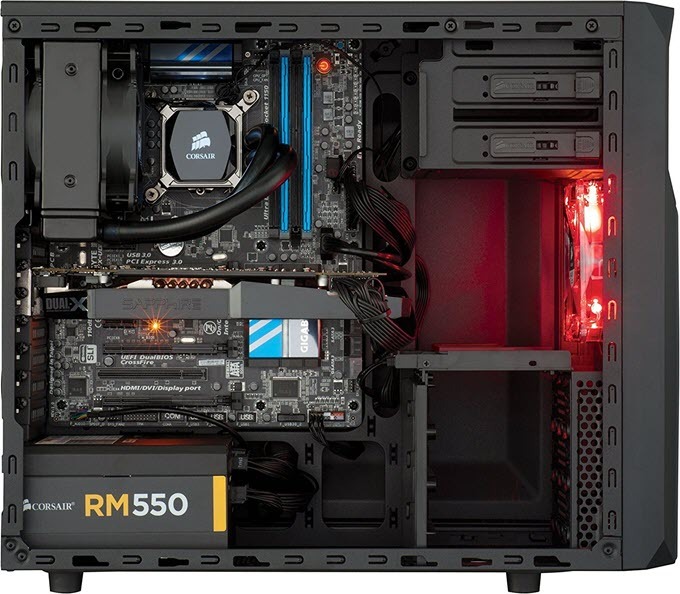 If you have built your own custom PC by yourself, then you would already know about all of your components, including the power supply, but if you are not that tech savvy and have purchased a pre-built PC, or somehow got an old PC from somewhere, then it might be possible that you don’t know about your PSU. So, to help you out, here I am going to tell you the ways by which you can find out about your power supply specifications. Why to know about your PSU? Now, the question comes why you should know about your PSU? 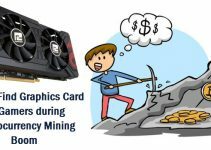 Well, the answer to this is that if you want to upgrade your graphics card, or want or add a graphics card or any other component, then you should know about your PC power requirements. This is because the new component will put extra load on your PSU, and if your computer power requirements exceeds your PSU Wattage, then it will stress out your PSU, and may cause it to fail or burn down, and this may also result in damage to your internal components. Also, if you want to upgrade your PSU then you must know about the specifications of your current PSU, so that you can make a right decision in choosing a better and more powerful power supply. Unfortunately, there is no way to know about your PSU specification by using any hardware detection software, because the PSU does not have any communication interface with the motherboard, as its only job is to deliver power to the components. Note: There are few high-end power supplies, especially from Corsair that lets you monitor and manage fan speed, temperature and power output through their software, e.g. Corsair RM / AX / HX Series power supplies. They include special cable/connector that connects through motherboard USB header, using a special hub e.g. Corsair Link Hub. Here are the ways by which you can know about your power supply details or its specifications. The most preferred way to know about your power supply or PSU, which is by opening your computer case side panel and look for a sticker or label on it, which provides the important information about your PSU, that includes PSU Name / Model number, Power/Wattage, Voltage and Current details. 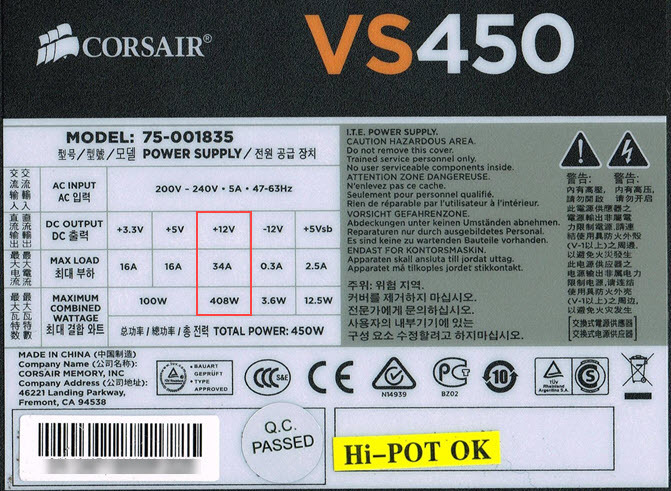 The sticker / label is present on every PSU, and it can be seen either on the sides or at the top, depending on the manufacturer. If you know how to read the label and what all the technical information on it really means, then it is good, but if you don’t, then below I am going to tell you all about it. PSU Name / Model – On the label, you will find the brand & name of the PSU, and its model number. 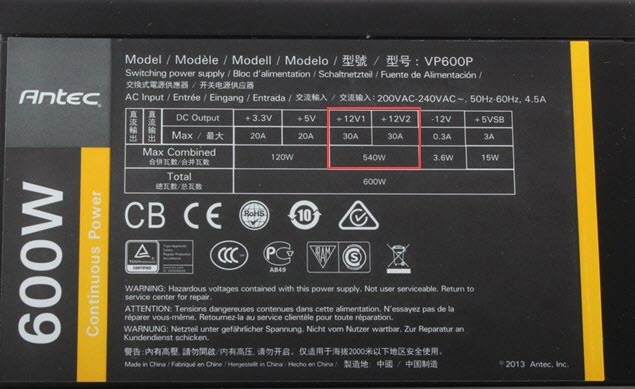 You can also find the total Wattage of the PSU, which is generally printed in huge fonts, and also the 80 Plus Certification Rating (if it has one). 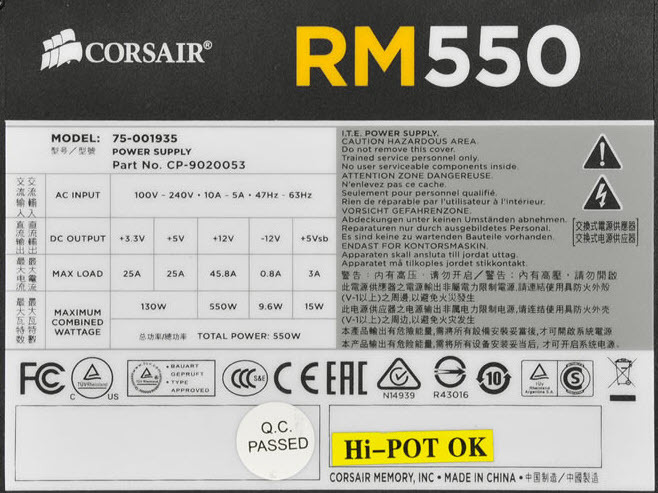 Below is a Corsair RM550 power supply of 550 Watts. Input Voltage – It is the AC voltage at which the power supply operates, and this you have to supply to it. For US, Canada and most South American countries, it is around 110V – 127V, and for UK, Europe, Asia, Africa and Australia etc., it is 200 – 240V. Some power supplies can operate in wide range of voltages i.e. from 110V – 240V, as they have auto switching mechanism to detect input voltage and can switch accordingly. However, others can have a physical switch that allows you to select appropriate voltage based on the voltage supplied in your area or country. DC Output – It is the output voltage provided by your power supply. The standard output voltages provided by a typical ATX PSU are: +3.3V, +5.5V, +12V and +5VSB. These are also known as Rails i.e. 3.3V Rail, 5V Rail and 12V Rail. Some power supplies do come with multiple 12V Rails, such as Dual 12V Rail, Quad 12V Rail depending on the PSU manufacturer or model. Here I have not included -12V Rail, because it is no longer used, and is present for some legacy support only. The +5VSB (standby voltage) Rail is always ON, and is used to power mouse, keyboard, memory, LAN and BIOS memory, when the PC in standby mode to support “Power On features”. It also provides small amount of power to BIOS & motherboard, even when PC is powered OFF (but mains in ON), and is used to start the PSU or Computer when you press the PC power button ON. Below, you can see a single 12V and Dual 12v power supply. Max Load (A) – Below each voltage level or Rail, you can see the maximum amount of current (in Amperes) that each Rail can provide. For example, if 12V Rail has 35A current listed under it, then it cannot provide more than 35A current combined for various devices or components that you have in your PC. If you overload it then it may result in PSU failure or computer shutdown. Total Power – It is total power of the PSU, which is expressed in Watts. Some manufacturers calculate the total power by adding the power of all rails, while others state this on the basis of total combined power present on +12V Rails only, because it is the most important Rail of the PSU, and is used to power 80% to 90% of your computer components that include your processor, graphics card, case fans, hard drives etc. After the opening the case, you can also check the number and types of connectors and cables that your power supply has. 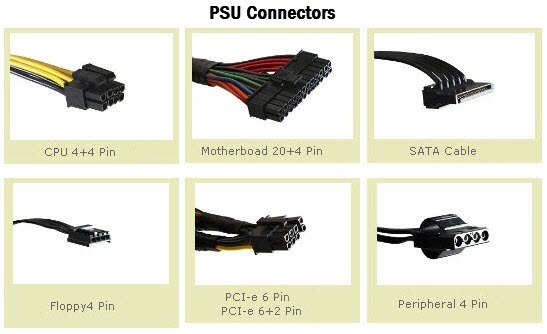 Below are the most common types of cables that you generally find in a power supply that is ATX 12V 2.2+ complaint. After knowing about the name and model number of your PSU, you can go to its manufacturer website to know more details about it. 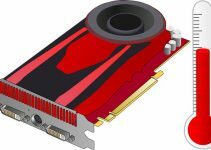 You can also download the PSU manual or specs sheet from there. For example, if your PSU is Corsair VS550, then you can search this model on the google or directly go to the manufacturer’s website to know about its complete details. If you have a pre-built PC then you can refer your manual for its specifications that can tell about the installed power supply. If you don’t have the manual then you can also refer the manufacturer’s website; search your PC model number there, and check out the PSU specifications listed there for your PC model number. This information might not be always accurate, because some manufacturers can change the PSU in their newer variants of the same PC model, so it is always better to open your PC case side panel to check your PSU model and specifications. What Graphics Card do i have in my Computer? If you are got any queries regarding the power supply (PSU) you have or its specifications, then you can ask me here by leaving a comment below.